Thank you so much for the outstanding fishing trip! Our experience was the highlight of our get away weekend. 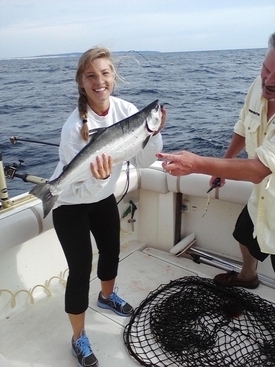 Your ability to find the fish was off the charts and to catch fourteen "whoppers" was unbelievable! Thanks for your hospitality, it was great getting to know you and Toni and if we are ever in the Pentwater area again we will be sure to take a ride on the Terminator III. Thanks Again and Keep on Fishing! In June of 2010 we had an awesome evening aboard the Terminator III! Last fall Captain Skip was kind enough to donate a charter to help Garfield Township Fire Department in the Eastern Upper Peninsula raise money for a new set of Jaws of Life. I was lucky enough to win the trip and take my wife, kids, my sister and her husband on the trip. All we can all say is WOW!!! My sister and her husband caught the biggest fish of there lives and we all had an experience that only Captain Skip could provide! I can't imagine a better Captain for a charter. First Mate Ryan was a great coach and first class all the way! Thanks again Skip! This definitely won't be our last charter with you! We are already making plans to have a new yearly tradition! 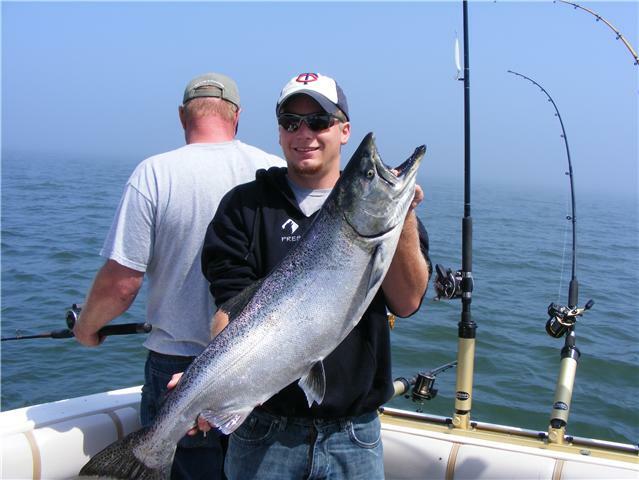 We had the pleasure of fishing with Skip and crew aboard the TERMINATOR in summer of 2008 and I must say it was one of the best trips we have been on ever with many memories made. Skip taught us many things about salmon fishing, techniques, what lures use, depths of water to fish. Skips boat is clean and really nice. Skip's prices are great and he definatly put us on fish. 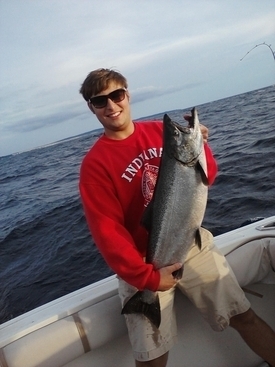 We will definatly be back to Lake Michigan aboard the TERMINATOR in the future!!! 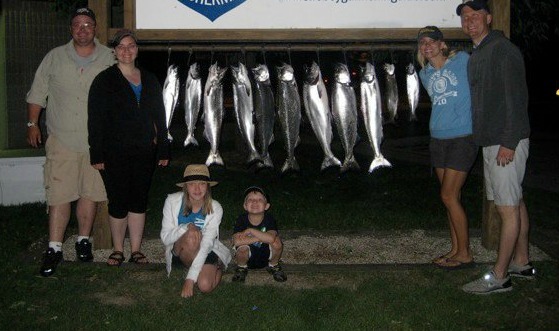 Just a short note to let you know that my daughter, son and I had a great time fishing with you and Toni last summer. Your boat and service was top notch and we are still eating some of the kings that we caught. In fact my wife and I enjoyed some of the salmon last night. My daughter in particular liked having your wife serve as the first mate. We look forward to a return visit this summer. 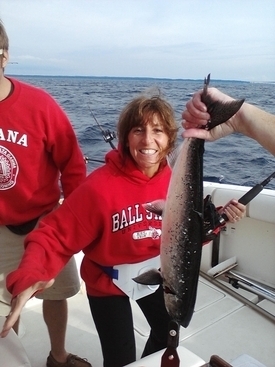 I had the opportunity to go fishing last summer with Captain Skip Berry on Lake Michigan. We made it a family event my sister and two of her boys came along to fish. We had a great day on the water with a lot of hook ups and 5 fish landed. 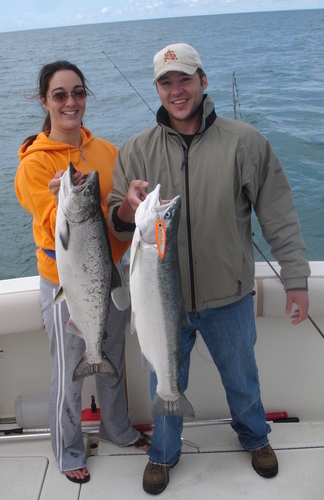 We landed some nice kings and 1 really nice steelhead and had a few get off as well. I would recommend this to any one whether they are die hard fishermen or just want to get out, relax and do a little fishing. 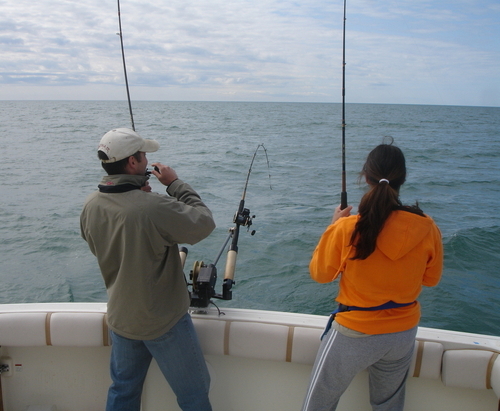 This is a great way to enjoy time on the water and fish at the same time. 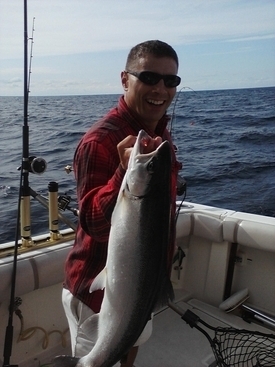 Captain Skip enjoys being on the water and knows how to fish so if you are looking to catch some fish and spend some quality time on the water quit thinking about it and just sign up and fish.